The book design has been altered to give extra width and length over the original Super Seven designed by Colin Chapman. The increased size is only a little noticeable when parked next to a real Seven. By itself it looks pretty normal unless you are intimately knowledgeable about Lotus Sevens. It seems everyone has a picture at this stage of development. Probably because getting the top of the frame married to the bottom seems like a real milestone. In retrospect, this really isn’t much. Another milestone is building the back portion of the cockpit. Still a long way from a finished car. Looking back, I wonder why I thought this was picture-worthy. There is so much yet to do. Yes that's a Chevy 350 in the foreground. It's going in my truck, not the Seven. The frame is pretty well underway at this point. 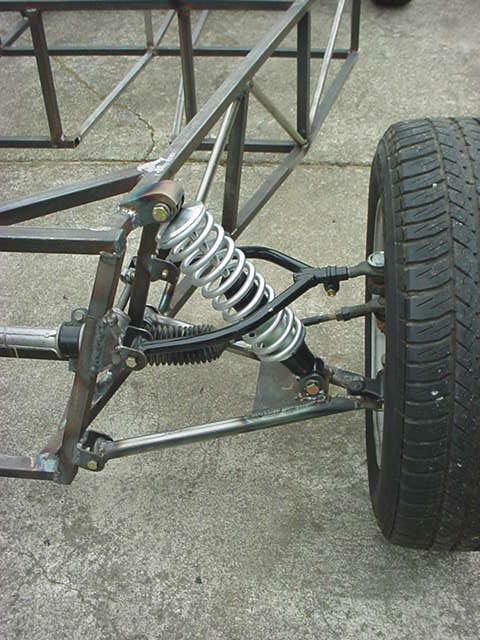 Here we have just finished checking front suspension geometry to assure proper camber shift with the body roll of an extreme corner. The steering gear is temporarily installed for a rough test of bump steer. There's more to come on that issue but if you don't read any further, the book instructions are misleading. To minimize bump steer, the tie rods must be parallel to the plane of the lower control arm. That's hard to judge in these photos because of the backward slant to the tie rods. 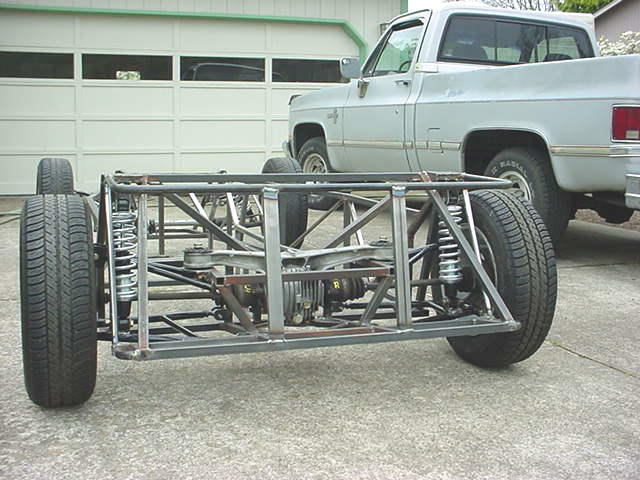 Now this is what I call a real milestone – a rolling chassis. Look closely at the rack-and-pinion. The rack had to be placed forward of the steering arm, so the tie rod angles back. That makes this photo look as if it is sloping up, but it actually is almost exactly parallel to the lower control arm. I made the mistake of moving the rack higher, and when the car finally got on the road, bump steer was a real problem. All was well after moving it back down. Here is a close-up of the front left corner. This gives you a little better idea of the way the tie rod angles back. This doesn't cause any problem with steering. It only adds a bit to the Ackerman angle in sharp turns -- actually desireable. The upper spring perch is not made the way Colin Chapman did it. It is more reminiscent of a street rod, but was necessary because of a slightly longer coil-over spring/shock. Looking down the side of the frame, you will see a good deal more triangulation, especially on the sides of the engine compartment. On paper, this should make a much stiffer frame. This only added a hair over a pound to the total weight. 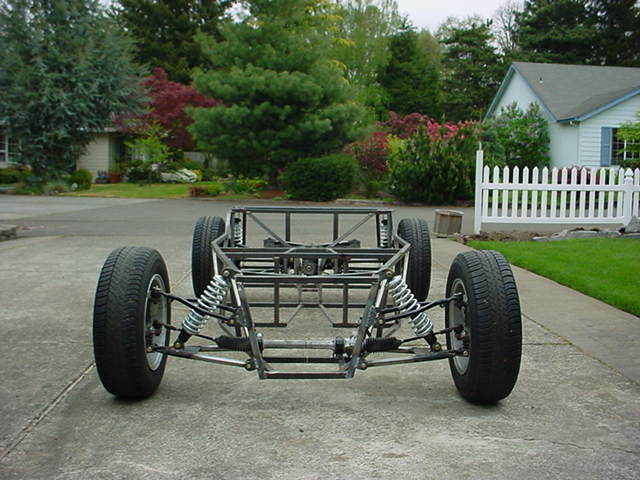 Independent rear suspension from a Mazda Miata. It took a little time to work out a suspension geometry because the book plans call for a solid rear axle. I had to design control arms that would produce the correct camber change under body roll, and have the strength and stiffness to propel the chassis forward. I also had to allow for the torque of the differential housing under acceleration - when the wheels turn forward, the axle housing tries to turn backward. The geometry seems about right. If anything, it may overcompensate camber just a bit in body roll, but the body doesn't roll much. It really sticks in the corners. 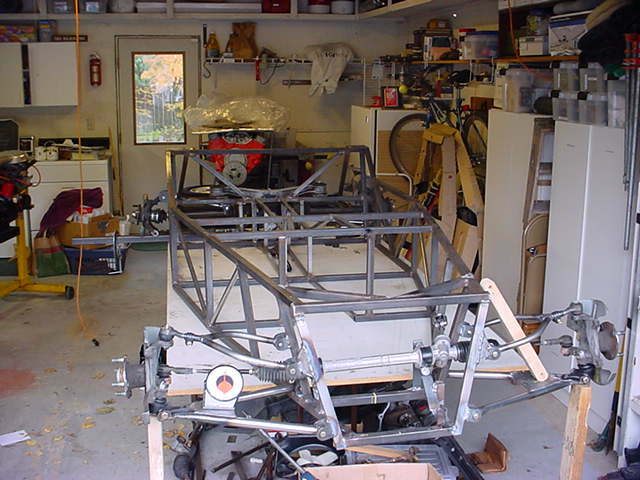 This photo shows the frame mounts for the pedal assembly, master cylinders, and throttle cable in place. Eventually the frame for the pedal assemblies will be enclosed by aluminum panels that will form a tidy little box similar to that of a Lotus Seven Series II. Naturally, it won't be exactly the same since these master cylinders face forward. The throttle cable works a bell crank that actuates the throttle (left of picture). The steering column is stabilized by the ball bearing pillow block right behind the upper U-joint. Even though it hasn't been on the road yet, steering feels very tight. You can see the frame is now bare, in preparation for paint. 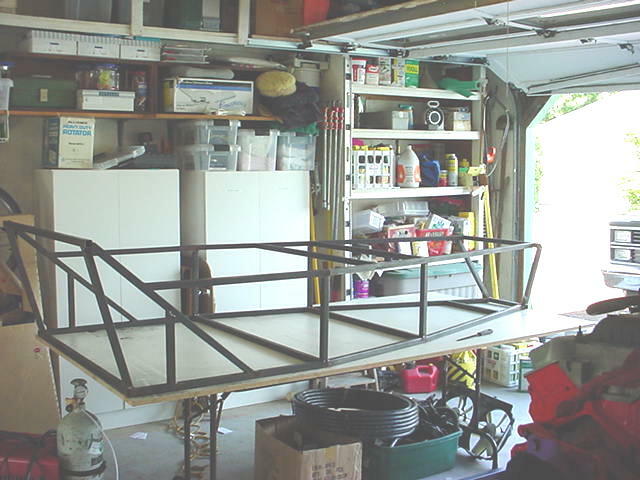 However, before I could start painting I had to decide what to do about a roll bar. I opted for a bolt-on unit. This photo was taken mid-process. The rear struts haven't been added yet. Here, steel plates were bolted to the frame's shock towers. 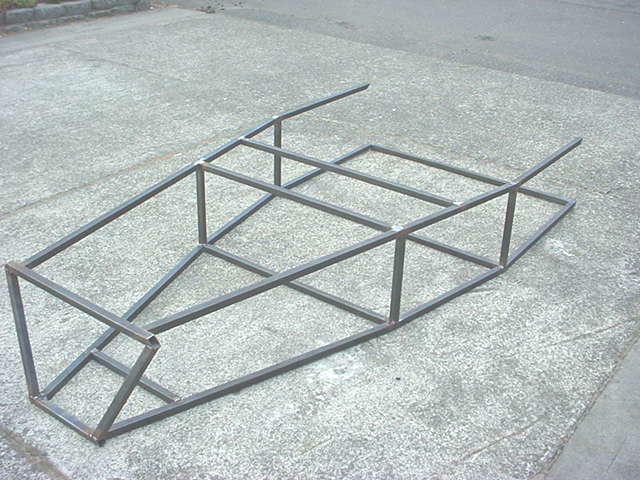 Then the roll bar was positioned and tacked in place. Next it was unbolted and final welds were done on the bench. Since the book frame was modified for independent rear suspension, here are a few words about what you see here. Tubes RU1 and RU2 are normally at the edge of the frame's axle opening. With IRS, they interfere with the lower control arms. Notice they have been moved inboard to be the anchor for lower A-arm mounting brackets. The book calls for an angle brace (tube Z) between RU1 and B1. Since RU1 has been moved, the four tubes that form a diamond provide similar stiffness. The diamond wraps around the bottom of the differential. One tube needed a notch to clear the differential nose. By the way, it takes a long time to paint all those tubes. The last thing I need to do to the frame is weld a mount for a torque reaction arm I fabricated for the differential. In the Miata, reaction torque is handled by a formed channel from the differential nose to the transmission tailshaft housing. In this photo, the torque arm is the diagonal tube that runs from the right side of the differential to a cross-brace at the top of the driveline tunnel. It is rubber mounted where it joins the frame to dampen vibration. The torque arm is heavy wall tubing in the shape of a Y. The Y end brackets the stock torque arm mount (top and bottom). It is a little like a ladder bar with the big end fastened with two huge through bolts between the top and bottom of the differential nose. Only one is visible at the right end of the bar. View of the other is blocked by a frame member. This probably has little to do with the frame, but I didn't know where else to show the fuel tank in place. The book calls for an aluminum tank, but I made this one out of mild steel. It's a lot heavier, but I don't have the equipment to weld aluminum, and paying a professional welder was just not in the budget. The steel tank is about eight pounds heavier than one made out of aluminum. Maybe some day I'll get a fuel cell. I designed the tank and frame so the take can be taken out the top. Not easy, but it can. That's the way it went in.